The best creamy peppercorn sauce. Yes I am tooting my own horn! No but really, this is an amazing sauce, poured over a steak, a good steak and it is happiness and hallelujah in your mouth. I promise you. See now, I have never been one to order my steak with peppercorn sauce. I’m more of a chimichurri or a bearnaise kind of girl. Peppercorn sauce, if not done properly can be really rank, and nobody wants rank sauce all over their gorgeous steak so I avoid peppercorn sauce like the plague. But the other day, I had lunch with some really awesome people at The Grand Cafe and Room in Camps Bay. And while I had the lamb burger, my friend had a steak with peppercorn sauce. And because I can’t keep my fork out of other people’s plates, it’s actually a really bad habit, I just don’t know how not to share my food. I’m all for everybody eat everybody’s food, taste a little here, and there and of course stay off my plate! no I’m just kidding I share my food too… I digress. So I tried the peppercorn sauce he ordered, and wouldn’t you know it, that sauce was amazing, peppery but not overpowering and was really silky. That sauce stayed on my mind. When something stays on your mind for that long, like that guy or girl who you can’t stop thinking about… some times you just have to pick up the phone and call him/her. 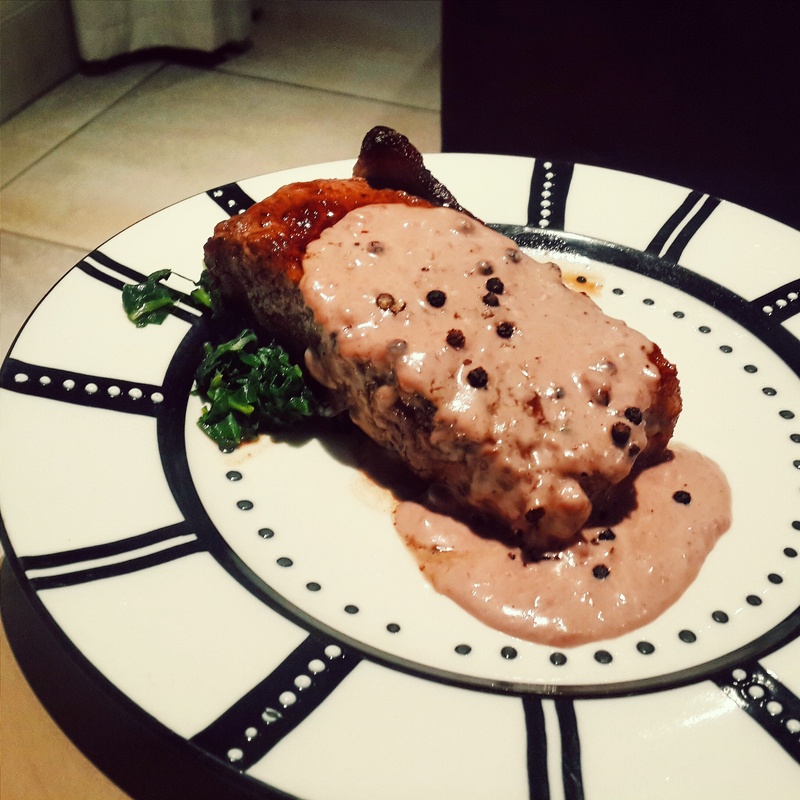 In my case, I had to have me some peppercorn sauce and I wasn’t driving all the way to Camps Bay, so I had to make it myself. I just had to. In a small saucepan melt butter over medium heat. Add green and black peppercorns and cook for 20 seconds in bubbling butter. Add stock, wine and bring to a boil, then simmer for 5 minutes to reduce the sauce. Add cream and cook for a further 5 minutes for the sauce to thicken slightly. Whisk for a further minute for the sauce to thicken. You can add cornflour mixed with a little water to thicken the sauce further. I didn’t add it, my sauce was quite thick. I also may have left my sauce on for too long, because it split a little, just a little. But I’m made this twice now and no splitting! Serve, poured over a steak or chicken, even over some vegetables it would be awesome. I had mine with a sirloin steak and spinach. I want to say mine was better than the one at The Grand Cafe, but I couldn’t. That one was the bomb dot-com, mine is the best.